Giulia Palermo is a computational biophysicist with expertise in molecular simulations. She was an early post-doctoral scientist in the NCCR MARVEL affiliated group of Prof. Ursula Röthlisberger at EPFL from 2014 until 2016, where she earned expertise in ab-initio molecular dynamics (MD) methods and in their application to biological systems. As of July 1st, 2018, she is starting her laboratory as Assistant Professor at the University of California Riverside, in the department of Bioengineering, where she aims at establishing a vibrant research program, interfacing computational biophysics with structural biology, chemistry and biochemistry. 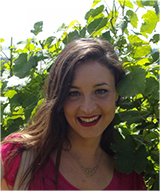 A native from Italy, Giulia Palermo earned her PhD in 2013 from the Italian Institute of Technology, working in the group of Dr. Marco De Vivo. After her postdoc at EPFL, in 2016, she was awarded a Swiss National Science Foundation post-doctoral fellowship to join the group of Prof. J. Andrew McCammon at the University of California San Diego. Her work has clarified the mechanistic action of biological systems of key importance, with studies on chromatin structure and dynamics, enzymatic function and ribozyme catalysis. She independently developed new research programs, clarifying the molecular basis of emerging genome editing technologies. This research was published in high-impact journals, such as PNAS, Nat Commmun, JACS, Acc Chem Res, Angew Chem, PLoS Comp Biol and others. Visit her research lab and watch movies of molecular simulations.